Had a tough week. I like to take myself seriously when discussing music with an artist. Music means a lot to me and rolling around my head are those questions that ride the line between fan and journalist. But, possibly, my avoidance and ignorance of the personal lives of these people puts me in a different place all-together. I am a writer/historian/musicologist and I don't need the sensationalism that comes with trying to corner someone on a personal, sensitive topic. So, why was it a tough week? Well, I had a chance to talk with a singer-songwriter where I could help him in promoting his new project and lead fans to his Facebook page (in a bid to increase pressure on a record label to reissue his long-out-of-print albums.) To record the interview, I had to go back to some PC technology that I abandoned for the Macbook earlier this year. We ran a test and everything went well prior to the interview. The very likable subject was amazing in the depth of his answers and the time he gave (over an hour.) I would even say that a friendship was made there. I thanked him and went off to edit the recording. It wasn't there. So, here I felt that I lost a tremendous interview, let down my subject and breached some boundary as a journalist. I just wanted to curl up and get over the funk that overwhelmed me. I quickly sent an email off to the subject and let him know that I felt like I had ran over my best friend's dog. There is a big time difference between us but I heard back about 5 hours later and he had this "sinking feeling" when reading my email as he felt we had "lightning in a bottle" there in our discussion. He offered some time a few days later to re-record. It possibly went better the second time around and didn't come across rehearsed. Of course, we had some hiccups during the live airing of the show (which he stayed in the chat room and talked to our listeners) but in the end... it came out pretty good. So, what can be said here is that success is a perception issue. I recall hearing that some of the biggest success stories in business came after at least 10 failed businesses. I can see that with relationships as well. 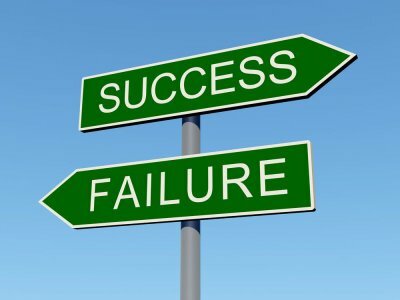 What seems like failure sometimes are the steps toward success. Yes, having what you viewed as success ripped from your hands by technology or human error is heartbreaking but sometimes it is an unseen step towards something greater. It also helps to treat people with honesty and respect as they may just smile and say, "Let's try again."